AA Bond Rating - What Does It Mean? What is a "AA" bond rating? 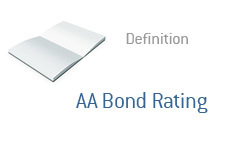 What does it mean if a bond currently has a AA rating? There are three major credit rating agencies - Moody's, S&P and Fitch. For all three agencies, the highest rating that a bond can have is AAA. AAA means that the bond has virtually no chance of a default. One step below AAA is AA. Now, all three agencies have three different AA levels. For Moody's, it is: Aa1, Aa2 and Aa3. Aa1 is the best of the three, and is one level below AAA. For S&P and Fitch, the ratings are: AA+, AA, AA-. As you can probably figure out, AA+ is the best of the three. Think of it like a grade in school - you can have B+, B and B-. AA is considered to be a high grade for a bond, but not quite a prime grade (that would be AAA). While a AAA rating means that a bond has "virtually" no chance of default, a AA rating means that there is a "low" chance of a default. Companies and countries with AA-rated bonds are in good financial shape, but there is still some room for improvement in the eyes of the credit rating agencies.